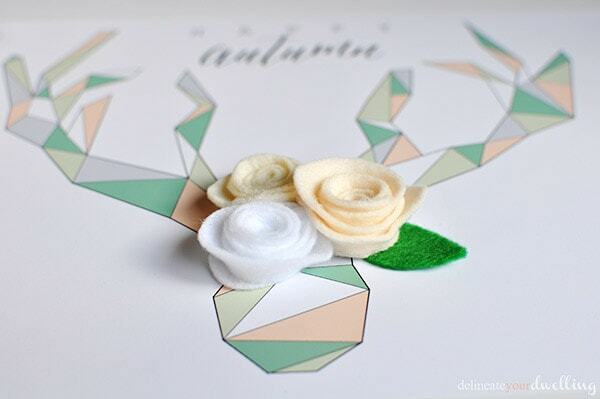 INSIDE : Download your free Geometric Deer Antler Printable page now and then learn how to add a few felt flowers to it. The perfect Fall Decor for your home. Fall is finally here in NM and I’m ready to wear my boots and eat soup everyday until Christmas time. 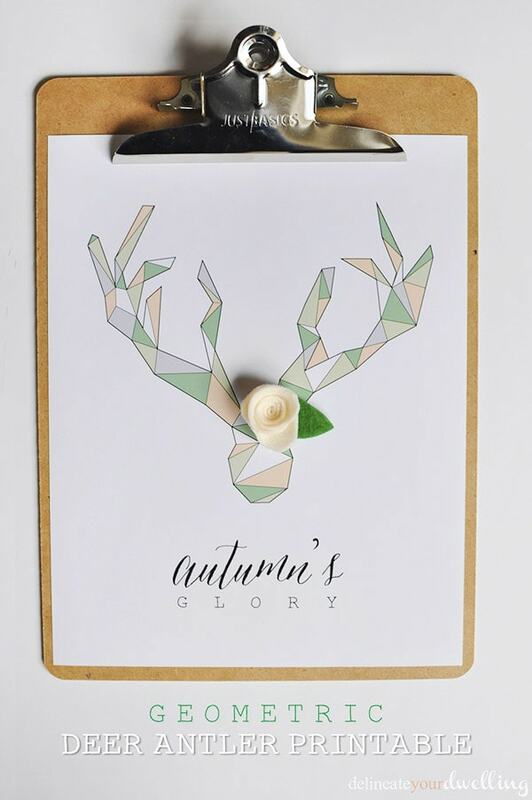 I also like cozying my house up a bit once there is a chill in the air and I made this fun Geometric Deer Antler Printable and hung it on my dining room clipboard gallery wall. Scroll to the bottom for your FREE printable! 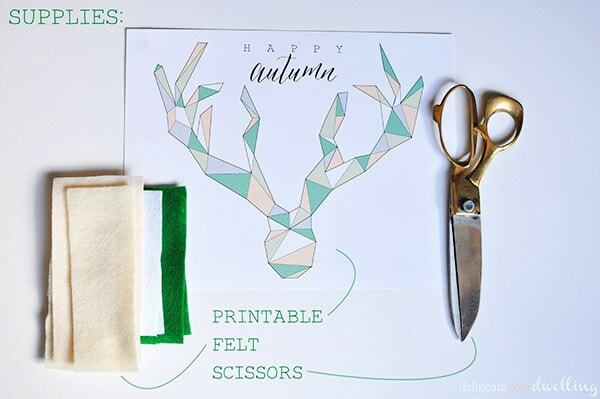 My supplies for this Stag Head printable project were quite simple. I designed the deer antler graphic and printed it out. (It’s available in portrait or landscape and also comes in a black and white option.) And then I pulled a few scraps of felt out, my scissors and hot glue. The felt flowers needed to fit this printable proportionately, so I made them smaller than typical. I cut rough 3″x4″ rectangles and then cut them into a spiral. 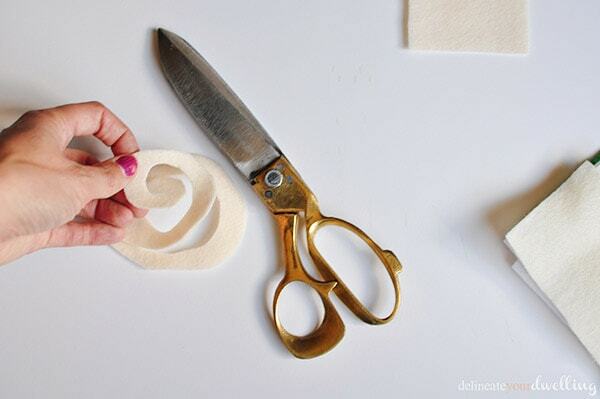 Starting in the center, wind the felt onto itself, adding hot glue as necessary to secure. After all my flowers were completed, I added a few leaves and glued them onto the deer’s head. I love the juxtaposition of the soft flowers and the hard geometry of the deer. The portrait styled print fits in so nicely with my clipboard wall in our dining room. 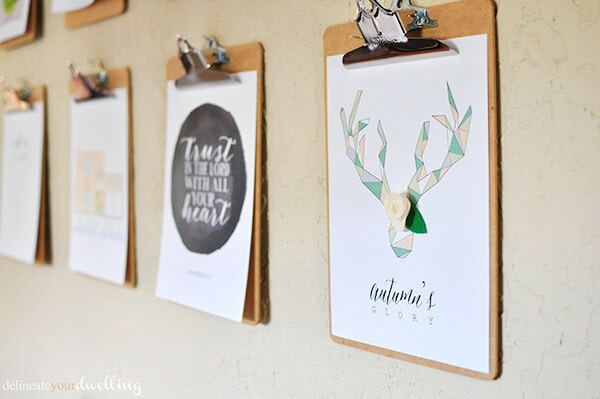 These Geometric Deer Antler prints are available to download in portrait or landscape, colored or black and white! 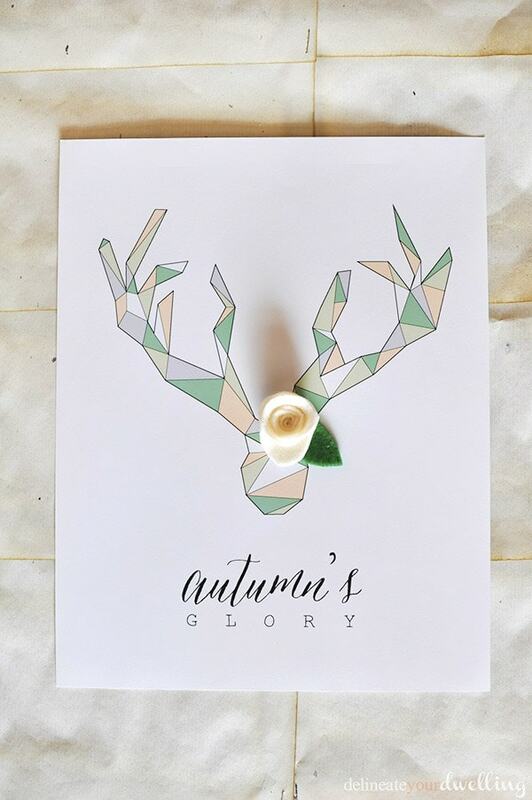 Sign up for the DYD Insider newsletter to receive access to my ENTIRE DYD Printable Library along with this Geometric Deer printable!!! Ok, I adore this. It’s pinned for safekeeping and I’ll be printing ASAP! 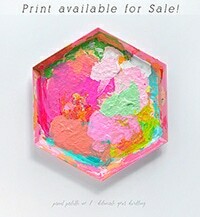 (As soon as I get ink back in that dern printer…grrrr….) Thanks for this! This is so pretty Amy- and so creative! Seriously, you’re a crafting genius! Way to take a 2-d print and make it 3-d!! You’re a regular feature at Outside [the Box] Amy!! 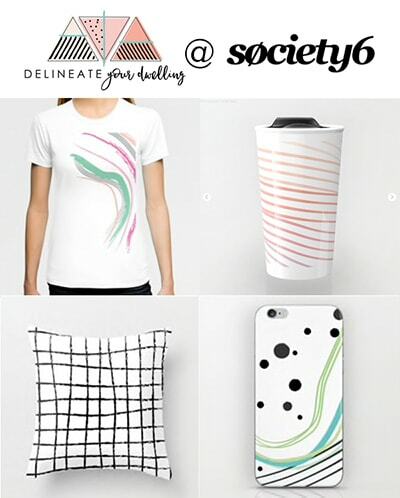 With killer projects like yours who wouldn’t want to share them with the world?!! Excuse me while I get my pin on! Trisha, you are so sweet! Thank you so much for the feature, I look forward to linking up tomorrow!! Trisha, just want to say that you crack me up. 🙂 xoxo!! Ummm, love, love, love this SO much, Amy! You have such amazing ideas!!!! Aw, you are much too kind Tasha!! Thanks so much, it was a fun one to make! I love geometric projects.. 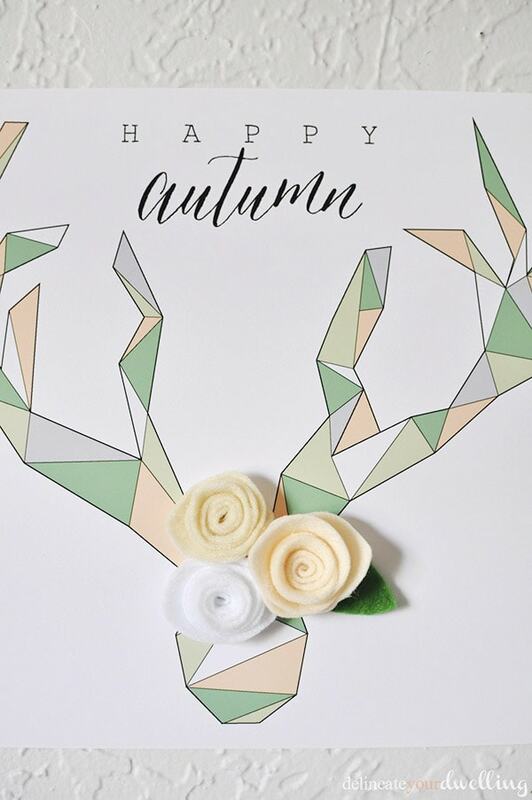 This deer printable is adorable! Thanks so much, Hani! I have one hanging in my dining room! I love this! I’m really into the elk head look 🙂 I first saw this trend in Germany and couldn’t resist. Thanks for the great printables. Thanks so much for stopping by, Sami! 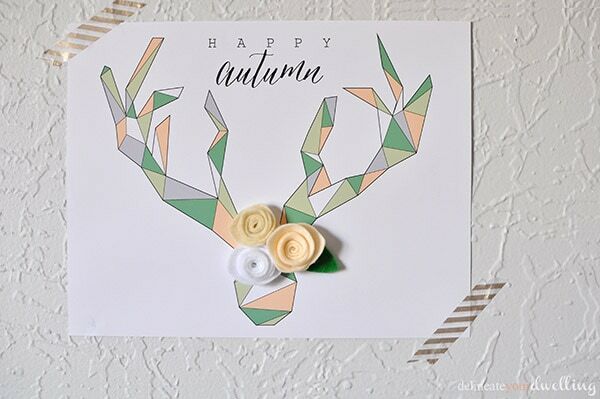 Amy this printable is so creative!! The added felt flowers are perfect! Thanks for the free printable!